A loan of $7,000 helped me buy a walk in freezer for new location which will help my business grow and increase efficiency! A life-long vegetarian I sampled a raw cake in Austin TX while visiting family. Amazed at the flavor, I began experimenting in my home kitchen, learning from my mistakes and from books. The dessert I wanted was vegan, gluten-free, and minimally processed, made from whole, organic ingredients - just fruits and nuts, with no compromises on decadence, elegance, or flavor. At the time I was managing a vegan restaurant and thought the restaurant’s dessert offerings were lacking. I bought my first Vita-mix, and soon, my desserts found their way to friends and parties. The response was wonderful to see, I love surprising suspicious non-vegans with delicious plant-based food. In January 2010, Karen Pride opened Prasad, a healthy vegan café inside the Yoga Pearl Studio in NW Portland. Not long after, having sampled the cheesecakes, she invited me to sell slices at Prasad. I would close Vita Café at 11 pm, and then go to Prasad and use their kitchen over night to make cakes. My hobby was taking a life of it's own! 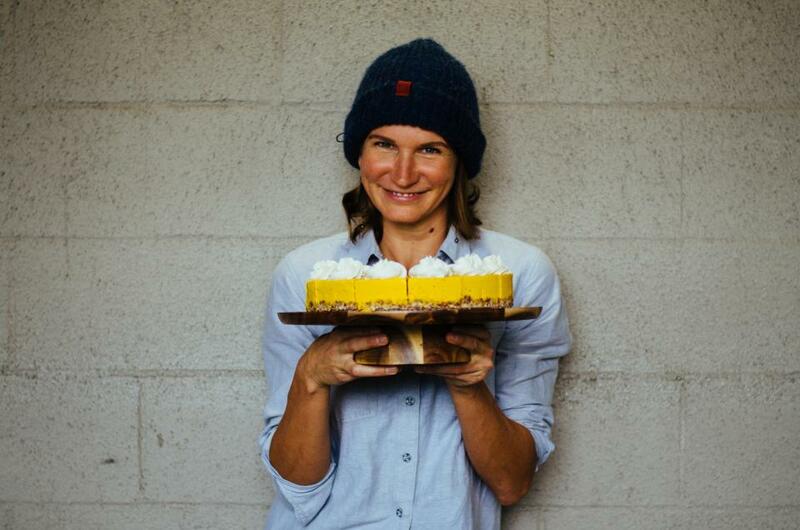 I noted that Portland has a huge appetite for tasty, healthy, and handcrafted foods, and felt this was the perfect birth place for a new sweet little company. It helps an female entrepreneur to expand her kitchen and continue to make delicious deserts. I founded my company, Rawdacious Desserts, 8 years ago in the wee available hours of a friend’s restaurant kitchen. Today my wholesome delicious desserts (that just happen to be totally plant based and gluten-free) are on the menus and shelves of 30 restaurants and 28 local groceries. Though we are still a very small business, our recent growth pushed us to the limits of our current space capacity and our potential growth demand we upgrade our equipment and customer interaction. Last November I made the difficult decision to pursue a new opportunity outside the Ford Building in SE PDX (our current home), even though commercial rates have risen dramatically in the past 5 years. The increase in overhead will be a challenge, but the future health of my company depends on new equipment and better customer facing to serve an increased demand in direct sales. It can be difficult to secure loans for a small business, especially when the owner owns no collateral (I'm a renter!) to leverage. This loan will helps secure my small business's and likewise my three employee's and my small family's goal of becoming a sustainable and healthy company. It's our realistic goal to double revenue in the first year of operation at the new location. I am seeking this loan in conjunction with a traditional business loan to finance the purchase and installation of a walk-in freezer for the new expanded kitchen we are building in NE Portland Oregon. Currently we are using 3 reach-in freezers which are often overflowing which cause delays and operational headaches. An 8x8 freezer offers us 4x the capacity and saves us time. We'll be able to maintain inventory for faster filling of orders and we believe it will help protect the integrity of our cakes. After growing out of our last kitchen, we expect to double in the first year operating out of our new space, this piece of equipment plays a large part in that process.